Handmade by artist Julie Nolan, each mythical pendant charts your birth month constellation in solid brass plated with shimmering gold. Inspired by a turn-of-the-century Swiss astrology calendar, Julie hand-stamps constellations into elegant patterns that span each piece. The larger openings represent the brightest stars shining in the sky. Handmade in Massachusetts. Choose from the 12 classic astrological signs: Aries, Taurus, Gemini, Cancer, Leo, Virgo, Libra, Scorpio, Sagittarius, Capricorn, Aquarius, and Pisces. Capricorn, and Sagittarius. Each piece is one of a kind and may vary slightly. Sold individually. See Julie Nolan's matching Gold Astrology Cuff. Making a name for yourself in the jewelry business isn't easy, especially in New York, but Julie Nolan has not only survived but thrived in the fashion-obsessed metropolis that's overflowing with so much innovation. Designing for ten years, Nolan began her formal training halfway through with a course in fundamental jewelry techniques. After that, she apprenticed under Hannah Clark and then Randi Mates of Aesa Jewelry. It wasn't until Nolan started her own line in 2009, and sold her work at street fairs, that she experienced what she described as "character building." Apparently, "It's not so easy conveying an air of sophistication and mystique when you're sandwiched between the World's Softest Socks and a Mozzarepa booth." With those days now behind her, Nolan has sold pieces to more than a dozen stores across the country and has forged more than a few high-end lines. With her new-found success and an interest in ancient texts and calendars, she has perfected her line of astrological pendants for all to enjoy and cherish. Please note, the Gold Astrology Necklaces have been discontinued. When each style sells out, it will no longer be available and will be removed from the drop down. I received this from my boyfriend for my birthday and I love it. I've been looking for an "everyday" type necklace in gold and this fits the bill. I can wear on the weekend, to work, etc. It's a conversation starter and I love having something that isn't everywhere. My only complaint it that is is a bit too short for my big neck. I plan to get an extender to lengthen it about two inches but it is definitely wearable even without the extender. My boyfriend also got it gift wrapped and it was wrapped very nicely. I will be getting one for myself and maybe my dautgher too..This was bought for my moms birthday, I can't wait to give it to her!! A good gift idea for "the woman who has everything". It's unique and adorable. So simple,yet unique and beautiful. I gave this to my sister for her birthday. She loved it and she wears it all the time. I thought it would be smaller, it is more of a medallion than a charm pendant. I planned to put it in a bracelet. but even as a necklace it's too large. This piece gets compliments all the time! It is really quite beautiful and unique. Such a unique gift that is perfect for the person who has everything. It's a good size and a beautiful color. 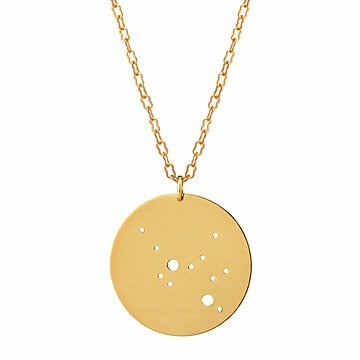 Handmade by artist Julie Nolan, each mythical pendant charts your birth month constellation in solid brass plated with shimmering gold.